I'm just smitten with Man Man's video for Head On! It features a delicious little ditty paired with a smorgasbord of choice Kitsch flicks... Including a few of my all time favouties: Carnival of Souls & Night Tide... Oh it gives me such thrills! Happy Thursday everyone! I hope you're all having a fantastic week! Well, here we are again, another Thrift Store Score Thursday! You may remember my first Thrift Store Score Thursday post... Way back two whole weeks ago! I had stumbled upon the cornucopia of goodies that is Vinny's Antiques Center . Ever since then I've actually been dreaming about going back there & exploring further. At night my dreams would take me to doors of forgotten rooms, containing treasures untold. During the day my mind would wonder idly to a few prizes I had regrettably forgone. I'd think to myself, might they still be there or what new arrivals might be in store for me when I finally do return? I think it's safe to say that Vinny's had gotten under my skin. So last Friday I was in full swing, getting ready for an early Oktoberfest soiree we were throwing at Hause Von Kitsch the following evening. There I was cooking & baking & making decorations feeling pretty confident that I had everything under control. I knew that certainly I wouldn't have to go back out & chase around for anything... Oh but that's when the madness hit! One of those bypassed trinkets from Vinnie's that had been haunting me suddenly reentered my mind & simply would not go away. A deer head drink poorer! Really, I don't know how I could have ever passed that up in the first place? 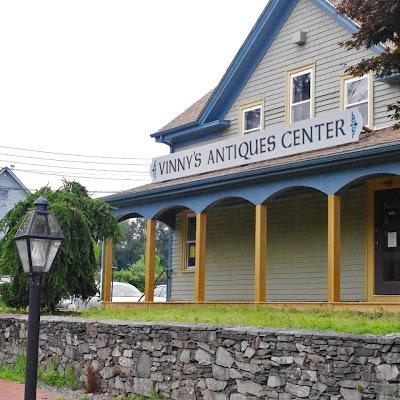 Anyway I'm still not quite sure of what came over me, but the next thing I knew I was abandoning my Black Forest cupcakes & Bavarian flag bunting & pulling out of my driveway, heading in the direction of Vinnies Antiques Center. It was a rather speedy expedition with *sigh* many stones left unturned (after all, I still had so very much to do) but I was on a mission. So I literally ran in & right back out of there, but I am certainly glad that I did! I am not really a beer drinker & I must say that little bucker absolutely was the pièce de résistance to my Jägermeister cocktails. Wouldn't you agree? Now don't forget this here's a link party! If you have any thrift store scores you'd like to share we'd love to see them! Never linked up to a party before? Here’s how: Scroll down, find the little blue “Add your Link” Button and click on that. Follow the instructions on the next page – add a great image of your project and an interesting title. Make sure you link to the direct page of your budget friendly post – not the main page of your blog! Try to visit at least a few other blogs at the party. Be sure to leave a comment to let them know you stopped by! Finally, please link back to this post somehow. There are badges available here; a simple text link is just fine too. That’s it! Feel free to tweet about Thrifty Thursday so others can join the fun, and don’t forget to check back here Sunday morning to see which posts have been featured this week! Link up your creative & thrifty ideas! Never linked up to a party before? Here’s how: Scroll down, find the little blue “Add your Link” Button and click on that. Follow the instructions on the next page – add a great image of your project and an interesting title. Make sure you link to the direct page of your budget friendly post – not the main page of your blog! Try to visit at least a few other blogs at the party. Be sure to leave a comment to let them know you stopped by! Finally, please link back to this post somehow. There are badges available here; a simple text link is just fine too. That’s it! Feel free to tweet about Thrifty Thursday so others can join the fun, and don’t forget to check back here Sunday morning to see which posts have been featured this week! Simply scroll down to the bottom of this post & click on the little blue button. Drop in your link, add an eye catching title & volia you're done! 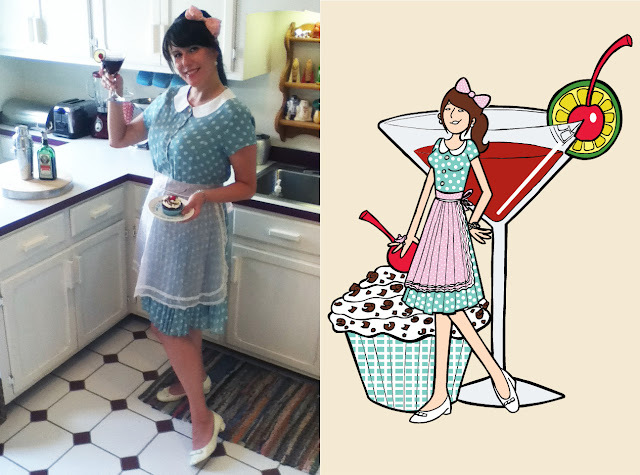 Did you know that you can cultivate & increase your happiness simply by wearing a polka dot dress? It's true! According to happiness experts & positive psychologists simply glimpsing a polka dot pattern prompts a release of a number of "feel good" hormones in humans, including serotonin, prolactin & oxytocin. So that means that the mere act of wearing spots will increase your happiness, therefore your quality of life & ultimately your productivity & enjoyment of your work... Not to mention that you'll be spreading cheer to everyone you see (or rather sees you) wherever you go... Sort of like a good deed doer! So I say don a speckled suit without apology or fear. You'll be doing yourself & everyone around you a favor. Of course cupcakes & cocktails will always do the trick too! Who knew letting the dog on the bed could look this good? Luxury long pile has long been a classic kitsch staple, but this bowwow boudoir takes it to a whole new level! 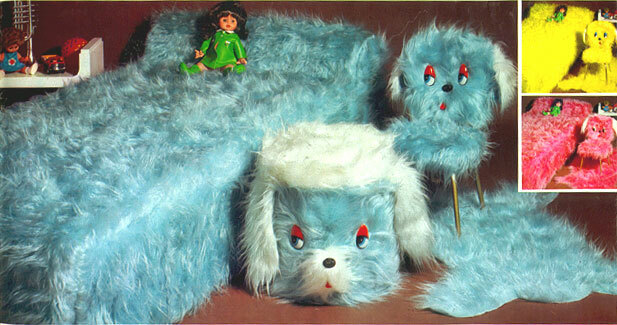 Just think of the puppy dreams you might have whilst slumbering on this shaggy mongril mattress set. Oh & it comes in three sumptuous shades... Bitchin! One Wednesday a couple months back I was at the local Salvation Army. You'll usually find me at Sal's on Wednesdays as it is "Family Day" & that means almost everything there is half off! Well on this particular Wednesday I was perusing the shoe section when I felt someone watching me. I looked up & our eyes met. We stood there, looking at each other, saying nothing. But it was the kind of nothing that meant everything. Oh how I had always wanted a pair of T.U.K. shoes... Of course being the penny-wise woman that I am, I could never justify the $100 price tag that came with them. But here they were, a pristine pair of T.U.K. kitty-cat Mary Janes staring me right in the face! In no time flat I was trying them on. I took a big breath & held it as I slid my toes into those babies & released a huge sigh of relief when I saw that indeed they did fit... perrrfectly. Then right there on the spot I did a little dance in them because they were mine! And the best part was since it was Family Day they were only $12.50! Isn't that just the cat's meow?! Simply scroll down to the bottom of this post & click on the little blue button. Then follow the directions on the next page & volia you're done!